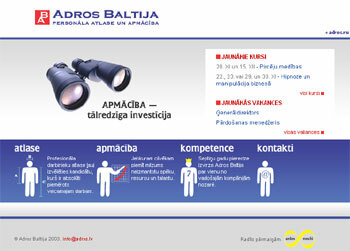 Adros Baltija is a personnel recruitment and training company, which has been in the market for seven years. It is one of the leading companies in the given branch in Latvia due to its experience, customers, and the scope of the completed projects. To recruit the right personnel and to train them means to increase a company’s efficiency – to generate changes. 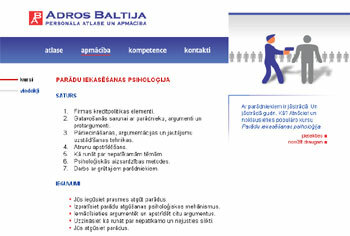 The Internet society mendo generated some pleasant changes by developing a new website for Adros Baltija. The design is harmonious, pleasant, and user-friendly. Navigation is simple and enables users to quickly find the necessary subsections. A pleasant impression is guaranteed during the very first minute of browsing, which is a significant indicator of quality. A special feature for Adros Baltija and its customers is the option “send to a friend”. It is a very simple way for you to inform your friends about anything they might be interested in. For Adros Baltija it is another possibility to attract new customers. For example, you.